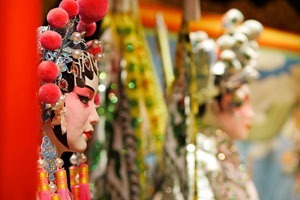 As one of the classic art forms of imperial China, Beijing Opera is a staple of cultural tradition in the modern era. Reflecting the opulence and dramatic storytelling from as far back as the mid Qing Dynasty (late 18th century), the actors and actresses keep the history of China alive with their vivid costumes and lilting voices. Beijing Opera is a synthesis of stylized action, singing, dialogue, mime, acrobatic fighting and dancing to represent a story or depict different characters and their feelings of gladness, anger, sorrow, happiness, surprise, fear and sadness. The characters may be loyal or treacherous, beautiful or ugly, good or bad. Their images are always vividly manifested in bright costumes that show the styles of ancient China. There are currently four main role categories in Beijing Opera. They are Sheng (生) - Male Role, Dan (旦) - Female Role, Jing (净) - Painted Face Male and Chou (丑) - The Comedy Role. Any role in these categories or sub-categories can be the leading role in a play. Except the second category - Dan (旦), the other three categories are for male characters. The traditional operas consist of mainly tales of preceding dynasties, important historical events, emperors and empresses, ministers and generals, geniuses and great beauties. They represent stories from the ancient times to Yao, Shun, Yu, the Spring and Autumn Period, the Warring States Period and the dynasties of Qin, Han, Sui, Tang, Song, Yuan, Ming, Qing. Some of the newer operas were adopted from literature and classical novels during the rise of communism. These are all very well known among the public but may not be an accurate account of history, as with art styles around the world. The melodies have harmonious rhythms and are described as graceful and pleasing to the ears. The melody may be classified into two groups: "Xipi" and "erhong." The performance is accompanied by a tune played on wind instruments, percussion instruments, and stringed instruments. The chief musical instruments being jinghu (a two-stringed bowed instrument with a high register), yueqin (a four-stringed plucked instrument with a full-moon-shaped sound box), Sanxian (a three-stringed plucked instrument), Suona horn, flute drum, big-gong, cymbals, small-gong, etc. Often the most recognizable feature of Beijing Opera, the costumes are graceful, elegant, and brilliant in color and design. They are mostly made using hand sewing and embroidery. As the traditional Chinese patterns are adopted, the costumes are of a high aesthetic value. 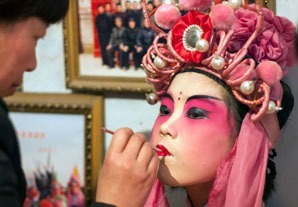 Make-up and sometimes masks are very important to the aesthetic of Beijing Opera. The colors are rich and depict different characters using symbolism of color. Black will often represent intelligent characters, while white indicate wickedness. In the past, stages in most Chinese theaters were square platforms exposed to the audience on three sides. Occasionally, stages would be exposed on all four sides and would have a central platform. In the latter case, performances could be watched from the back also, which changed the blocking of the operas. Much like the traditional stage curtains in the West, an embroidered curtain known as a shoujiu was hung over the platform, which divided into two parts: the back stage and the stage. Read more details on Beijing Opera Stage Set-up. The theatrical or musical occupation was considered the lowest class in Chinese society for many years. 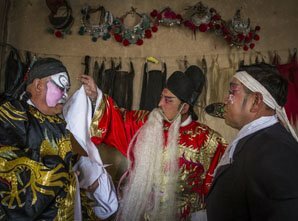 Beijing Opera, as with other art forms, used to be a male dominated profession but has since become more gender equal as society progresses. 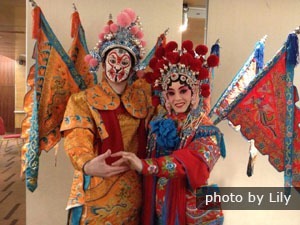 Read more on Beijing Opera Players. Li Yuan, literally means pear garden in Chinese and also refer to the place where opera players trained. There are many Beijing Opera masters often play here. 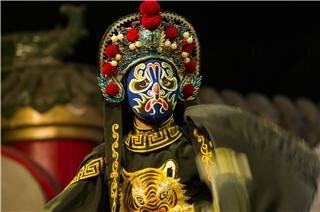 Booking: If you are interested in Beijing, our travel experts could arrange a Beijing Opera show for you on your Beijing tour. 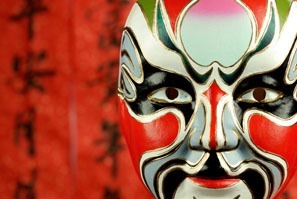 Beijing Opera has a history of nearly 200 years. In the 55th year of the reign of Emperor Qianlong of the Qing Dynasty (1790) , four big opera troupes from Anhui Province entered the capital and combined with Kunqu opera, Yiyang opera, Hanju opera and Luantan to create what we now know as Beijing Opera. Over a period of more than half a century of combination and integration of various kinds of opera there evolved the present Beijing Opera. It is the most significant of all operas in China, and it has a richness of repertoire and a large number of famous artists that give it a profound influence in China. The traditional plays share a large role in preserving Chinese culture for new generations. Since Mei Lanfang, the grand master of Beijing Opera, visited Japan in 1919, Beijing Opera has become more and more popular with people all over the world. It has made an excellent contribution to cultural exchange between China and the West. Nowadays, you can catch traveling troupes of Beijing Opera performers in many international cities and local "Chinatowns." It is better to see once than to hear a hundred times. 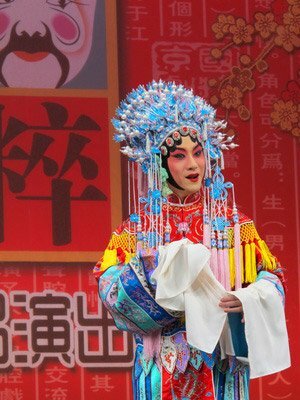 If you want to learn more about roles in Beijing Opera, you can enjoy a Beijing Opera show when you come to China. Here are two recommended Beijing tour: Private 4-Day Emperor&apos;s Tour of Beijing Tour and 2-Day Beijing Boutique Tour. Or if you have more interesting ideas, you can tailor-made your own China tour with us and discover more with less hassle and more flexibility.